The Lost Colony of Roanoke is a mystery that has baffled researchers for many years. Over time, evidence has been lost or forgotten. There have been many theories and archeological sites started to figure out the answers to this question over the decades. To this day, no one knows what happened. The disappearance of the Colony of Roanoke is considered to be one of the greatest unsolved mysteries of the world. Here, you will learn what we know so far regarding this group of individuals. The mystery of the lost colony of Roanoke lies with a second expedition to Roanoke. This expedition was to bring wealth and land to England with the help of the native tribes that befriended the English in the new land. Previous expeditions ran into hardships and eventually set sail back to England. The arrival of the second expedition found structures of the first settlement intact along with a few skeletal remains. There were one hundred seventeen men, women and children amongst these settlers. Among them was Governor John White. Also among these settlers was Eleanor dare, the daughter of John White. Eleanor is noted for giving birth to the first Christian in the new world, Virginia Dare. Within the next month, things were starting to go bad for the new settlers. Supplies were running extremely low and they were also in need of reinforcements. After a meeting with the other members of the colony, White set sail for England to replenish supplies and other would be colonist. Before leaving Roanoke, the colonist had setup some details. These details would let John know that if something went wrong they would leave him a sign of where they would be by carving the destination into a tree. They also agreed that if the terms of relocating were bad that they would also carve a cross into the tree. In doing this, White encountered several obstacles that would delay his return by almost three years. 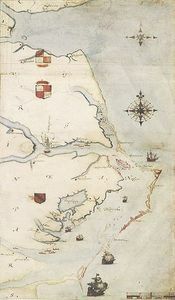 Obstacles such as war and weather would be the demise of John White’s return to the colony of Roanoke. After many years and a lot of hardships John’s return would bring with it a mystery. When he returned, the only evidence that the colony ever existed was the fence that surrounded the perimeter, a few cannons and nothing else. Houses and structures had vanished without a trace. A tree was found with the word CROATOAN inscribed into it. There were no reasons to think that the colony had met hostile situations since no carving of a cross was found. John White also discovered that certain things that he had hidden were ruined or gone. There are many theories of what may have happened to the colony of Roanoke. Some of these theories are farfetched while others may have some validity. There are those that think the colony was abducted by aliens. Some of the more believable theories are those that believe the colonist immigrated into the Indian tribes of the area. There are stories of fair skinned people living among the tribes that help backup these theories. Whether they lived their lives among the Indians or were abducted by extraterrestrials from outer space or just vanished into thin air, the lost colony of Roanoke is still one of them mysteries that we may never know the answer to. Today, many individuals are attempting to discover the answers to these questions. If you are interested in the world’s greatest unsolved mysteries, it is likely that the disappearance of these individuals will spark your interest.